At Nokia World we were able to spend some time with the newest E series phone, the E63. The E63 is basically an E71 in new skin and with a few less features. Looking at the phone's face, you can hardly tell the difference between the two. In fact, the E63 uses the same screen, same control buttons and same keyboard as the E71. The keyboard felt no different from that of the E71, which is a good thing. Typing is comfortable and easy. The buttons have a real good feel to them. Same goes for the D-pad and control keys. In a side-by-side test, they felt indistinguishable from the E71. Everything else, however, does feel different. Where the E71 has a luscious metal skin, the E63 is clothed in plastic. The sides and back of the E63 have a soft-touch paint job and feels nice and grippy. It is slightly thicker than the E71, especially near the camera on the rear, where it now bulges just a bit. 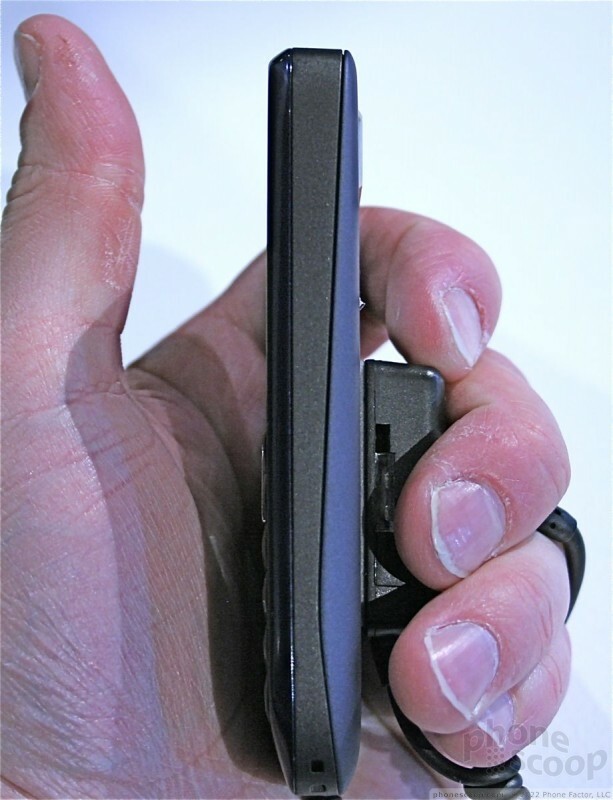 On the left side of the phone you'll find two hatches covering the microUSB port and a 3.5mm headset jack. This is a change from the E71, which uses a 2.5mm headset jack. Oddly, the volume control buttons have been deleted from the right side of the phone. In fact, all of the buttons have been removed. There is no volume rocker on the E63 at all. Volume needs to be controlled with the D-pad and on-screen menus. 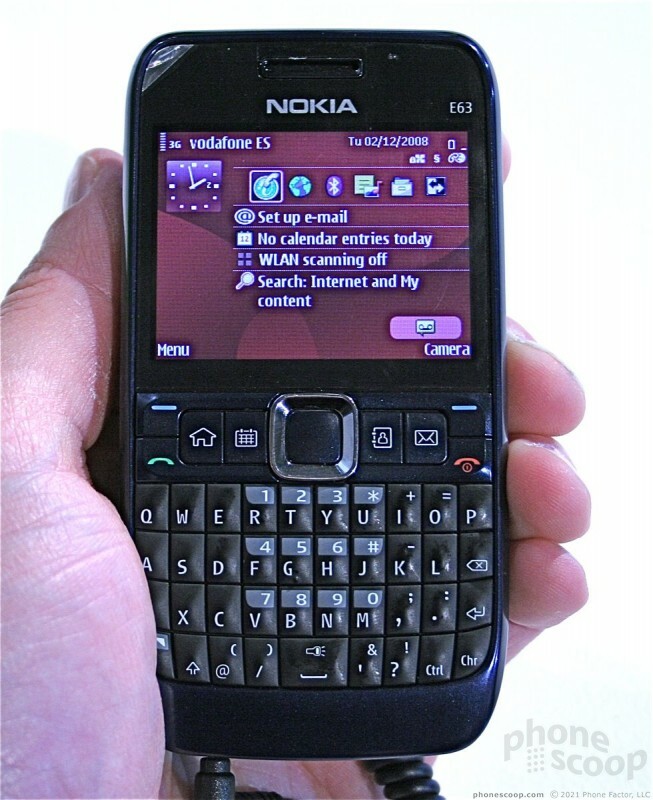 It runs Symbian S60 3rd Edition with Feature Pack 1, which is the same as the E71. It also has the ability to switch between profiles, such as a "business" profile for use during the day, and a "personal" profile for use when not working. These profiles let you customize the toolbar and let you have two version of it, giving you access to different sets of applications depending on which you use. The camera has been downgraded from 3.2 megapixels to 2 megapixles. It retains the flash, but loses autofocus. It also didn't operate as quickly as the E71's camera. Pictures looked "OK" but not all that great. In all, it isn't a bad messaging phone at all. It certainly doesn't have the higher-end appeal that the E71 wields, and that is reflected in the much lower price point. Be sure to watch our quick video on YouTube.